Baggage Capacity 157 cu. ft.
As one of the top choices for a business jet charter, the Gulfstream III (also sometimes called Gulfstream G300) offers both class and functionality. 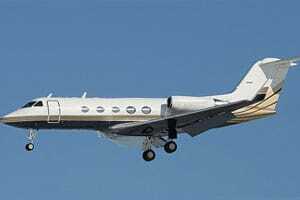 Powered by two Rolls-Royce Tay engines, the large-cabin, mid-range Gulfstream III can fly 3,600 nautical miles nonstop, fly at a cruise speed of .80 Mach and reach an altitude of 45,000 feet. This business jet charter features the largest cabin in its class and a third more baggage space than their closest competitors. The Gulfstream III, a leading private jet charter, provides ample space, allowing all of your corporate jet charter passengers to maximize their onboard productivity. Additionally, the cabin’s 12 large signature windows and 100-percent fresh-air system ensure a comfortable environment in which to work or relax. The Gulfstream III, our premier heavy jet available for private jet charter, offers a convenience 16 passenger capacity as well as an airspeed of 500 miles per hour. 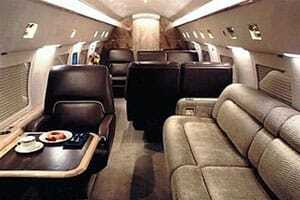 The aircraft has a range of 4100 and a baggage capacity of 157 cubic feet. This private jet charter features a cabin width of 7.3, height of 6.1 and length of 41.3 all for your convenience and comfort.